"Forbs" redirects here. For the former football player, see Forbs (footballer). 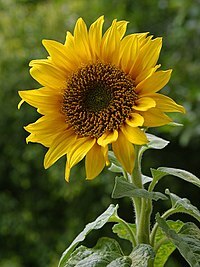 Sunflower (Helianthus annuus), a large forb. A forb (sometimes spelled phorb) is an herbaceous flowering plant that is not a graminoid (grasses, sedges and rushes). The term is used in biology and in vegetation ecology, especially in relation to grasslands and understory. "Forb" is derived from the Greek φορβή (phorbḗ), "pasture" or "fodder". The spelling "phorb" is sometimes used, and in older usage this sometimes includes graminids and other plants currently not regarded as forbs. Forbs are members of a guild – a group of plant species with broadly similar growth form. In certain contexts in ecology, guild membership may often be more important than the taxonomic relationships between organisms. In addition to its use in ecology, the term "forb" may be used for subdividing popular guides to wildflowers, distinguishing them from other categories such as grasses, sedges, shrubs, and trees. Some examples of forbs are clover, sunflower, daylily, and milkweed. ^ Schröder, Hans (2009). Grasslands: Ecology, Management and Restoration. Commack, N.Y: Nova Science Publishers. ISBN 1-60692-024-3. ^ Jaeger, Edmund C. (1959). A source-book of biological names and terms. Springfield, Ill: Thomas. ISBN 0-398-06179-3. ^ Scott, Robert Pickett; Henry, George (2007). Liddell and Scott's Greek-English Lexicon, Abridged: Original Edition, republished in larger and clearer typeface. Simon Wallenburg Press. ISBN 1-84356-026-7. United States Department of Agriculture Natural Resources Conservation Service link to Growth habits Codes and Definitions.